Starting at the beginning, a bay window has three lites of glass and frames and a bow has four or more lites of glass and frames. Frame thickness is a huge concern for many. Some folks like a heavy frame reminisent of the old wood windows and some prefer a thinner more streamlined frame that allows less frame and more glass and light. .
All homes settle to some degree and custom manufacturing the mullions allows us to take out the discrepancies one window at a time and disperse them across the opening. It just leads to a better looking install. There is indeed a lot to know. There are a lot of options and choices and seldom is the same thing right for every home. Knowing someone with some expertise in all the options is immensely valuable. I hope you'll look through our gallery of projects and take note of the special attention to detail we provide on every project. It becomes really important when you get to a bay or bow window because they are such focal points to the home itself. A well done bay will look great and increase the homes value, an ugly one will do the opposite. It takes real talent to get one to look great from every side. This is a discussion that comes up a lot. Keeping the most glass possible. We have the best options out there for an upscale look that is unsurpassed. We're very proud to have ten window manufacturers to choose from and more options than anyone in Dallas for great looking bow and bay windows. All of our products have full lifetime manufacturers warranties and of course have heat reflective Low E Glass with Argon Gas filled insulated glass for unparalleled energy efficiency and utilty savings. These types of windows can be the leakiest ones in the house. It just makes sense to get them energy efficient when they encompass that much square footage of glass. So many questions and so little space on a website... This is the interior view of a slim line bow with colonial lite grids. The kind that comes out usually has 4 horizontal bars instead of 3 horizontal and one vertical bar. This is the more modern look to go into its place. We can do grids in any pattern you'd like. I recommend putting up tape to simulate a new idea and decide if you like it while it can be changed as opposed to guessing that you'll like it. A roll of tape goes a long way when it comes to grids and exploring the options out there. Note that the glass is still pretty large and the frames are minimal.. Sometimes we convert a six lite bow window into a three lite bay to cut down on exposed frame and that can also be a bit cheaper as you're buying three windows instead of six. In those cases the sill and curve of the brick stay the same and some skill in installation trims it out to look good. Again the real component on these is skill. bay, windows, bow, slim, frame, framed, custom, mull, mullion, muttons, grids, between, glass, dallasContact us! The flankers are the windows on the ends. Usually they operate but not always. In this case they are double hung and operate from the top or the bottom with a half screen that can be used on either one. This and single hung flankers are the most common things we see but there are casement options as well. As you can see, our custom bent mullions and trim make the day on these. The top has a custom trim as well and the outside is completely maintenance free and can be hosed off with a water hose. No headaches and long lasting beauty. This one happens to been installed in 2006 and I just happened to go back to the house and see it. Great installations are their own reward when you see your work last for decades and longer. This is a commitment we have to you and your home: Better home improvements that last longer and are worth more when you sell the house. In 2015 and beyond there is no reason to have leaky hot bay windows that leak air and cost you energy dollars. What we all need is windows that are quieter and help keep our air conditioning inside the house. bay, windows, double, hung, hungs, remodeling, home improvements, energy, saving, efficient Contact Us! This is a little more money but a great look. If you use casement windows as flankers you can keep out the horizontal bar and have that picture window look while still being able to operate the window and get air and ventilation. The casement window swings open like a door with a screen mounted on the inside of the window. It is easily removable if you want that clear glass look, and it snaps back on if you burn the chicken and need to air out the house. Casements are one of our favortite products and in this prefabbed bay window they really look great. This was a pre-fabbed bay and it went into an opening that had just a twin window previously. In this case there are cable supports that run up into the facia to support the weight of the bay unit itself. It's a great look and floats to the inside of the home with casing for the finished product. It's constructed out of 1 1/2" plywood on all four sides. While not cheap, these are beautiful and make a great little window seat as well as offering more light than we had when it was a twin window. slim, narrow, frame, framed, bbay, windows, bow, flankers, casement, vinyl, pre-fabbed, fabricated,window seat Contact Us! This is the interior view of our bay windows. This one used the oak with oak trim and a light oak stain with clear varnish. I have to confess the customer did the stain and varnish as we're great carpenters but not painters so much. The job did look great. It was one of our better before and after shots because the contractor before us did a terrible job putting up a bow with a square roof over it. All the projects on this site are actually projects in the Dallas Fort Worth Metroplex. We're proud to serve Dallas, Arlington, McKinney, Frisco, Richardson, Plano, The Colony, Flower Mound, University Park, Southlake, Lewisville, Irving, Mid Cities, Duncanville, Denton and all points in between. We really love what we do and you'll love it to, for many many years, we promise. There's so little we can do that really improves our quality of life. This is one of those great places where a few thousand dollars changes the entire home. No, they aren't cheap but there is nothing that looks like a great bay or bow window. In cases like these with shutters I think they're better without grids but I only look at them for a day or so. We want you to have whatever is most appealing to your eye. This one uses Alside Mezzo Vinyl Replacement Windows with Single hungs on the ends and picture windows in the middle. This window does have the heavier frame but offers a .26 U value which is quite a bit lower than most Energy Star Rated Windows. This product is acually 2016 compliant and one of the highest performing windows we offer. Alside has seven different glass packages and also offers a Low E Glass with considerably less color than many other manufacturers. The green tint in windows is an observation I field a lot when looking over new window replacement projects and these guys are my go-to provider of windows that have a little less color in the glass. Keep in mind that the color is part of the Low E coating and less color does mean less efficient but when the right glass package is used you can have great performance and a clearer looking glass. bow, windows, window, grids, low, less, color, glass, low e glassContact Us! 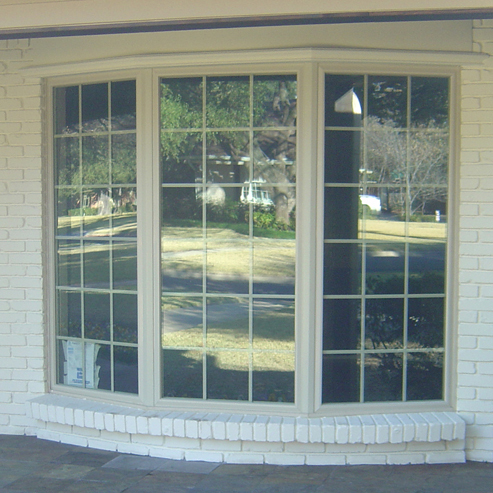 Many modern vinyl replacement windows have very fat frames. This loses glass and can make for a heavy look that many find distasteful. In Dallas we see lots of them that should have been replaced years ago but weren't because the homeowner just didn't want that huge plastic mullion in their home windows. The Slim Line Series is something that very few window and door contractors have but it's a big part of what we sell here at The Window Connection. 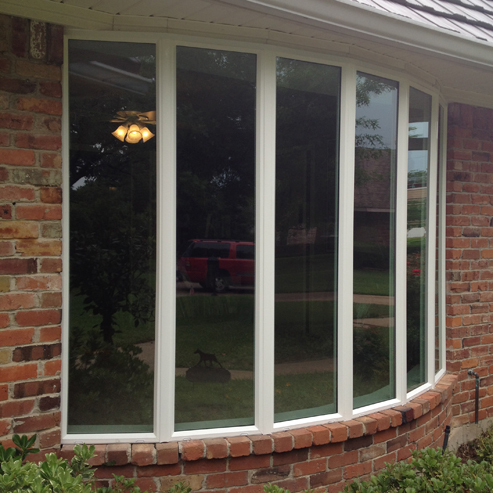 We offer the Slim Line to give you more glass and still have one of the highest performing, most enegy efficient windows available in North Texas. Coming in with a Solar Heat Gain Coefficient (SHGC) of a .21, it's one of the highest performing windows you can buy today for your home windows and yet still has super high performance for energy efficiency. The mullions too are a Window Connection exclusive. We custom bend all our mullions to allow us to make them a little out of square when needed and split the natural settling of your home windows amongst all of the windows instead of having it show up all in one place. This takes a very high skill level that is not common with most window and door installers. It's one of the many things that makes us better than most home window installers. bow, bay, window, windows, slim, narrow, frame, framedContact Us! Color of window comes up a lot and bears a paragraph or two on the subject. White is very staunch and somewhat "kerpow" I'm new!! A more relaxed look is the Beige or Tan color. Both of those options are pretty cost effective and keep you in a standard pricing. Many of our manufacturers have custom colors and there's an Adobe or Sandstone color that's fairly uncommon from a few as well. Knowing who makes what and getting the right thing for a home isn't a one size fits all proposition. Having several window manufacturers and several models from each means having a full pallet of options and assures you get the right window for you, your family and your home. This was done with Jeldwen Slim Line Picture windows but I can get a similar result from NT Window with their slim line product. These are the two narrowest framed vinyl windows and certainly produce a great look for our bays and bows. bow, windows, window, beige, colonial, grids, muttons, mullions, JeldwenContact Us! Sometimes it works to convert a bay into a bay with fewer windows or a bow with just three windows as we see in this picture. This one in Tan was a six lite bow before. We had to rework the top but the bottom stayed the same. This was an Alside Mezzo Tempered Picture window trio with custom mulls that we did for a house flipper. This one has colonial lite grids but no grids tends to be more the trend nowadays. Knowing how to save some money on a bow is a big part of what we do. Getting the right installation is crucial. A bad install is the primary complaint when reading reviews and blogs. Bay Windows and Bow Windows take incredible skill and attentiveness to details. Most Window and Door contractors use sub contractors that may or may not have real skill and experience. We make it our mission to put the highest level of skill on every project. Anything less can really sacrifice the look and the ability to get good resale value and energy efficiency out of your bow or bay window. bow, bay, windows, window, beige, tan, colonial, grids, muttons, mullions, AlsideContact Us!